Walker Edmiston! The vaguely familiar name of an exceptionally Gifted, entertainment talent. Actor, Producer, Singer, Comedian, Voice-Over genius and "master-stroke" choice for an exceptional Master of Ceremony host, Walker may not have the name recognition, but you've seen his face and heard his 'voices' hundreds of times! Walker had a remarkable career in radio, movies, stage and television that spanned over five decades. Walker was born on February 6, 1926 in St. Louis, Missouri. He discovered at an early age that he could perfectly mimic other people's voices; he used to entertain his family and friends with spot-on vocal impressions of the Hollywood greats, such as the singular voice phrasings of stage and screen icon, Lionel Barrymore. He amused all with wit and humor, the voices of local townfolk which somehow pointed Walker's head to the entertainment capital of the world, Hollywood. Unfortunately, World War II interupted Walker's immediate plans (as it did for many). And when the war ended, Walker made his way to Los Angeles and enrolled in the famous acting institution, The Pasadena Playhouse on El Molino Street, just three doors south of the Rose Parade venue, Colorado Boulevard. Shortly after, Edmiston was introduced to animation producer Walter Lantz while performing in a play. This in turn lead to his first steady job doing various incidental voices on the children's show "Time for Beany." The die was cast, Walker never looked back! In the 50's and 60's he hosted "The Walker Edmiston Show," a children's TV program broadcast in Los Angeles which featured puppets of Edmiston's own creation that included Kingsley the Lion and Ravenswood the Buzzard. Walker worked often for Saturday morning TV series creators Sid and Marty Krofft; he supplied the voices of Sparky the Firefly on "The Bugaloos," Dr. Blinkey and Orson the Vulture on "H.R. Puffnstuf," and Big Daddy Ooze on "Sigmund and the Sea Monsters." Moreover, Edmiston portrayed a crazy old Civil War prospector on "Land of the Lost" and had a recurring role as token benevolent and intelligent Sleestak Enik. He also worked on the animated feature, The Great Mouse Detective". Walker provided the scary grunts and growls for the ferocious Zuni fetish doll in the final and most frightening segment of the made-for-TV horror anthology "Trilogy of Terror." Walker did the voice of Inferno for the "Transformers" cartoon show. For twenty years Edmiston was the voice of both beloved "nice guy" Tom Riley and the notorious Bart Rathbone on the popular radio program "Adventures in Odyssey." In addition, Walker was the voice of Ernie the Keebler Elf in countless TV commercials for ten years. Among the TV shows he had principal roles on are "Maverick", "Thriller", "The Virginian", "Green Acres", "Get Smart", "Star Trek", "The Wild, Wild West", "Bonanza", "Mission: Impossible," "Gunsmoke," "Fantasy Island," "The Waltons," "Little House on the Prairie," "The Dukes of Hazzard," "Falcon Crest", "Knots Landing" and many others. And he appeared in practically every TV Western ever produced! He appeared on several recordings with Spike Jones, looped actor's voices on numerous films (one of these jobs was doing the off-camera lines for Orson Welles in "Start the Revolution Without Me"), and even supplied many different voices on all five "Planet of the Apes"pictures (he's the voice of the talking baby chimp in "Escape from the Planet of the Apes"). He played General Douglas MacArthur in the much anticipated Television event, "War and Remembrance". He was Samuel "Mark Twain" Clemons in the Disney produced mini-series, "Mark Twain's America". And lest we forget, he was responsible for many of the voices for the landmark children's cartoon of the 80's, "The Smurfs" and also, "The Gummi Bears"! 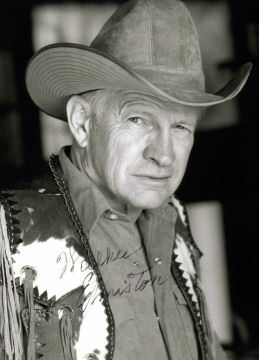 In 2005 Walker was MC of the coveted Silver Spurs Award Banquet and "brought down the house" with his friendly, comedic deliveries, the unforgetable medly of his 'stroll-down-memory-lane' of his amazing voice work and the pin-point timing that is so rare in a Host today in any medium. An indelible performing presence of any entertainment aware citizen, America was Blessed to have experienced the many contibutions, albeit without the name recognition, of Walker's (mostly) annonomous Gifts from such a remarkable Life in Hollywood. Our own Reel Cowboy, Walker Edmiston died from complications from cancer at age 81 on February 15, 2007.
with help from Sheldon Altfeld and Woody Anders.